Was your ancestor too important to send to war? When Britain declared war on Germany in August 1914, it was widely believed that victory would be achieved by Christmas of that year. However, it soon became very clear that the war would not be won in a matter of months and public and political attention quickly turned towards maintaining the war effort. Despite the fact that over 1 million men had enlisted voluntarily by January 1915, the escalation of hostilities and increased casualties meant that after a year of fighting, the British Army was thinly stretched. The situation became even more desperate as the need for skilled workers at home began to heavily compete with the need for soldiers at the front. 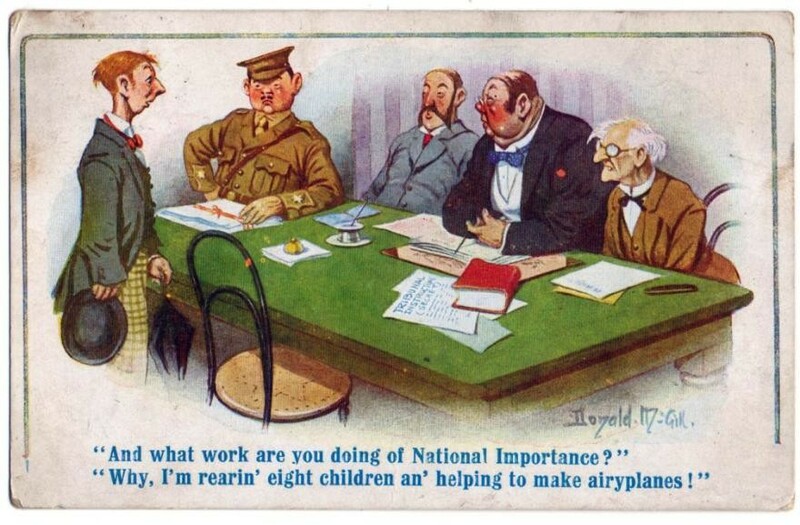 After attempts by both the Under-Secretary of State for War, Lord Derby, and Prime Minister Asquith to encourage men to step up, the government could no longer see any alternative to introducing compulsory active service in order to stay in the war. The Bill which became the Military Service Act was first introduced by Asquith in January 1916 before coming into force on 2 March 1916. The Act declared that men from 18 to 41 years old were liable to be called up for service in the army unless they were married, widowed with children, serving in the Royal Navy, a minister of religion, or working in one of a number of reserved occupations. A second Act, passed in May 1916, extended liability for military service to married men, and a third Act in 1918 extended the upper age limit to 51. Men or employers who objected to a man's call-up could apply to a local Military Service Tribunal. Military service tribunals were bodies set up by local councils for men who wanted to appeal for an exemption from conscription. The Tribunals were charged with accessing individual circumstances while protecting national interests and, while they were made up of magistrates, councillors, local business leaders and/or labour delegates, they would always include military representatives to ensure they worked in the best interest of the military. Transcripts of Tribunal records will reveal your ancestors name, occupation, age, the date of their application and hearing as well as their employers name, business and address. Images will provide further details such as the grounds for an appeal and the decision reached by the tribunal. If your ancestor was temporarily exempted from service, the length of time is provided. 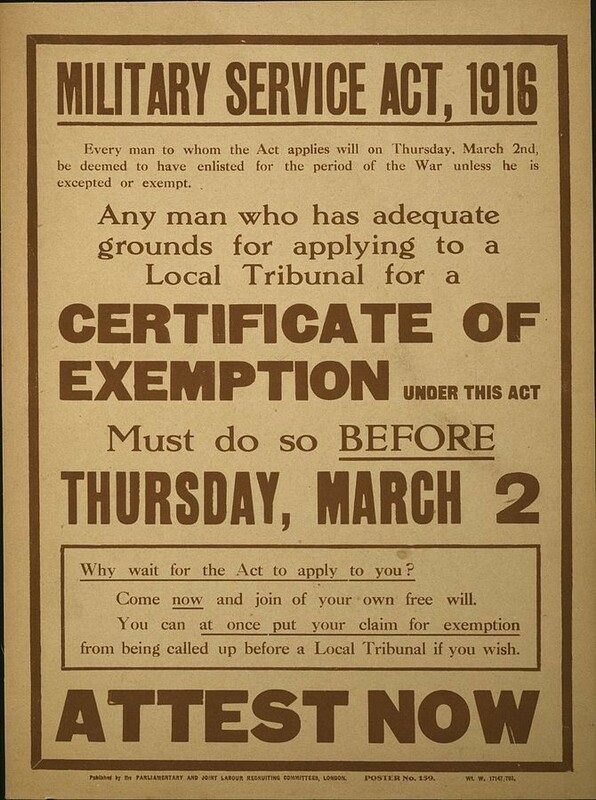 Men had the right to appeal conscription on a number of grounds. One such example would be if he were employed in a position of national interest, such as farming, mining or industry. Other reasons for appeal included ill health, infirmity, exceptional financial or business obligations, or conscientious objections. Conscientious objectors were not always given an exemption, but they could be assigned to non-combatant positions. Hearings were usually short, lasting no more than ten minutes, and those appealing were permitted to have a solicitor present. The tribunals allowed exemptions on an absolute, temporary or conditional basis. Absolute exemption meant the individual would not be required for active military service for the duration of the war. On 13 July 1916, John Aitchison was found to be absolutely exempt from service because he was engaged in work of national importance as a farmer. These case files are packed with powerfully poignant stories. The Northamptonshire records alone contain examples of mothers begging for their last surviving sons to be spared, of villages pleading for their last remaining baker, and even of sisters writing to request their brothers be taken into the army to "do them well". Examples such as these show the devastating impact the war had on communities and families across Britain. Search our Military Tribunal indexes to unlock the personal stories within your family or local community.